There’s folklore surrounding March’s birthstone, Aquamarine, that the stones are mermaids’ treasure. Since it was believed that these stones came from the sea, many sailors used them as a talisman to navigate the seas. The Greeks believed it had calming powers over the sea and would grant them safe passage on their journey. The Romans believed that Aquamarine was good for young lovers and often used the stone as a gift for a bride the morning of her wedding. For cultures in the Middle East, this gem was thought to be a symbol of happiness and everlasting youth. In Europe, it was said to be an antidote for poison, which made the stone popular at a time where many royals were being poisoned. Some people think that Aquamarine will increase courage and help with communication skills. Others believe that it brings the wear or carrier inner peace to deal with challenging situations. Aquamarine belongs to the Beryl family, which is a group of gemstones that are commonly known to carry metaphysical properties. Other stones in this family include Emerald and Morganite. 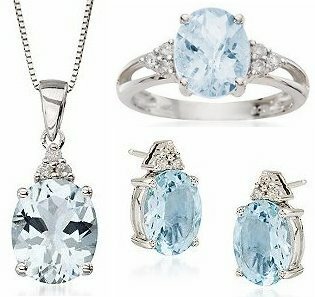 Overall, Aquamarine’s color is what makes this gemstone so popular for jewelry lovers. However, the folklore surrounding the stone makes it a very intriguing gift.